Love,Love these bar stools! Great quality also !. I purchased the dark ones and are great ! You will not be disappointed for sure !Best purchase ever! Take a seat at the counter with this stylish swivel chair. Designed with vintage charm in mind, this chair features a classic slat back design paired with a linen upholstered seat cushion for lasting comfort. 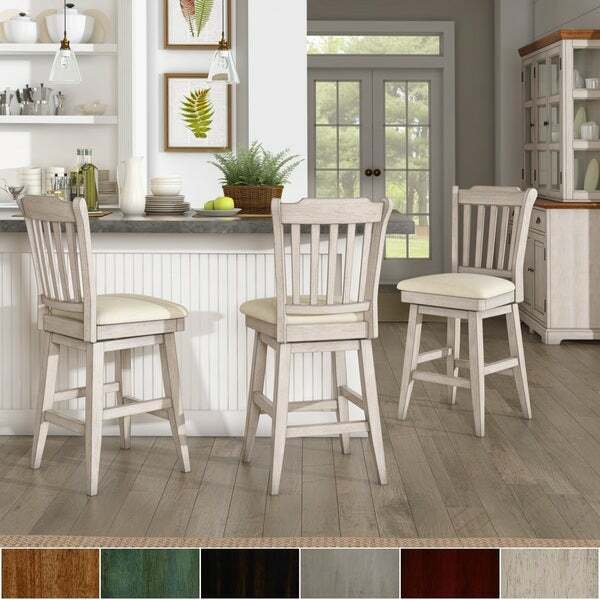 In a variety of distressed finish options ranging from neutrals to bright colors, these chairs are sure to make a statement in your space. Assembly required. This product ships in 1 box. AtiNSPIRE Q, our designer-curated lifestyles reflect current trends and timeless essentials, giving you the know-how to achieve your vision. With diverse style inspirations to choose from, you'll be able to find the one that speaks to you - or mix and match across collections for a style that's all your own. Whether you're cool and contemporary, retro, free-spirited, vintage, or classic, iNSPIRE Q is here to help you achieve the home of your dreams, every step of the way.Click here to explore the six style inspirations: iQ Bold, iQ Modern, iQ Classic, iQ Artisan, iQ Junior, and iQ Oasis. 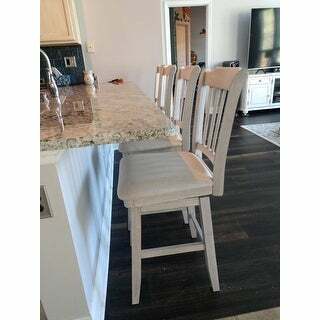 These are very sturdy and comfortable counter height bar stools. They are easy to put together also. The grey backs go well with my granite counter top. These swivel chairs are very well made, I bought the antique white and they go perfectly in my kitchen, sturdy and comfortable. I would recommend these swivel chairs. I have been looking for affordable swivel counter height stools for a year and a half. Well i thought i had found something in the Eleanor Slat Back counter height swivel. I needed something Strong , (hubby is 6' 2" and weighs 295 lbs) sturdy and had to knock your socks off as far as looks.as i had just remodeled my huge kitchen a 15000.00 venture. I didn't want something that looked cheep. I needed 7 stools to fit at my island. I ordered 1 stool and it came last week, hubby put it together yesterday and i am thrilled it looks amazing! Waiting until tomorrow to order other 6 as there is a big undisclosed sale. Thanks overstock for having such great products!! I may change the seat cover to a tweed fabric but that is a simple fix and that is just a matter of taste. I would definitely recommend this stool. I will submit pictures once i have all 7 chairs in place. I ordered the black as i have maple cabinets with ebony crown moldings the contrast is stunning. 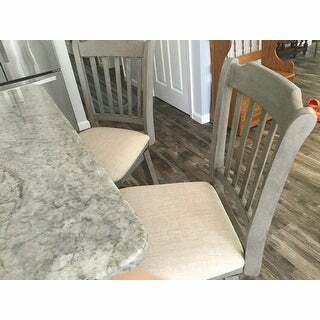 I absolutely love this counter chair...I originally wanted to get the oak color, but they were out, so I ordered the antique green and am so glad I did. It is beautifully finished and goes well with my decor. The assembly directions were easy to follow. It is a nice quality chair. Extremely satisfied with this purchase. Assembling this will take some time. So get ready to carve out some time. But after it is set up, the chairs look awesome and feel comfortable to sit on. Even though these are swivel chairs, they don't swivel that easily so I end up not even using the swivel feature. You really have to put some muscle into making the chairs swivel. 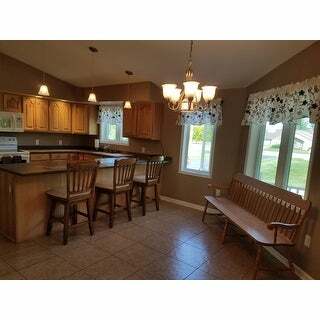 Love the counter chairs. They are comfortable and they look awesome. I will order 2 more to finish the seating around our island. 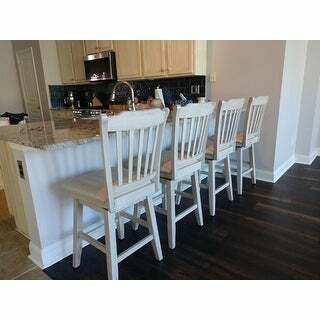 These counter height chairs are comfortable and seem sturdy. I ordered the antique black color. The color is darker from the online picture. It is almost solid black. The material on the seats is nice. The chairs do swivel but they do not rotate easily. Assembly took about an hour per stool. Love these chairs. I have had so many compliments on them. My husband had to put the chairs together but everything went smoothly and had them together in less than 15 minutes. These chairs were my third attempt to find good quality, attractive chairs at a reasonable price and I couldn't be more pleased. They went together fairly easily. The instructions were easy to follow and it took maybe 90 minutes for two of us to put all four together; the first took the longest of course and the last was done in 10 minutes. I'm very happy with the look and quality; these are nice, well-constructed chairs that will last a long time. Sturdy, comfortable but the "antique" finish was too heavy handed, they appear more light brown than antique white. I am keeping, but repainting the finish to tweek to match other "antique white" pieces I already own. Beautiful! Easy to assemble and look just like the pictures! Love these stools in my kitchen!! I ordered 3 oak and although they are a little darker than pictured, it pulls on the dark grain in my cabinets. They arrived very quickly and I was able to put these together by myself. The first one took the longest but after that, they went quickly. I would suggest working on a table from the very beginning. Quality excellent! Swivel excellent! Easy to assemble! Comfortable seats for most part. A bit more padding would be nice but that is a minor complaint. Great counter stools at an excellent value! The chairs shipped very quickly. I thought they were a little pricey. However, I love the look of the chair and can’t wait to use them in my new house. Absolutely, by far, the most solid barstools I have ever bought. You wont be sorry, well worth the money. I would recommend these chairs to anyone 5 stars! Great price and goes great in my new kitchen. The stools were fairly reason to put together. These chairs are exactly what I was looking for. Comfortable, stylish and easy assembly! These chairs a beautiful and sturdy, they look great at by bar! Love the bar stools. Perfect match for my new renovated kitchen. They were larger than I thought but not a problem. My husband and grandsons put them together with no problems. They are quite heavy and sturdy. Perfect.!! "What is the height from the floor to the top of the seat?" Seat dimensions: 18.7 inches wide x 18.7 inches deep x 25.8 inches high. Overall: 19.1 inches wide x 21.7 inches deep x 42.5 inches high. "do the bar stools swivel around completely?" "I ordered two of these in December in black. Love them! Quality very good, sturdy and they look great. I now realize that I want a third one and the black is no longer available. What are the odds of them becoming available in the future?? I messed up!" "I like the look of these stools but I have young children who use them to eat. How easy are the seats to wipe off? I’ve had vinyl ones for 10 years & I’m hesitant to buy anything else"
This item is not stain resistant. For cleaning we recommend using a soft dry or damp cloth. "Does this bar stool not come in oak finish any longer"
This item in the oak finish is estimated to be back in stock in May 2019. "will the Eleanor counter height ladder back swivel BLACK stools definitely be restocked?" This item, in antique black is estimated to be back in stock in December.